York, N.Y. 10006, effective im- mediately. Established in 1964, Anker Ma- rine Paints is the U.S. represent- ative for W. & J. Leigh & Co., one of the largest British paint companies. Series production of such a ship could significantly lower construc- tion costs and cut production time, helping make the American mer- chant marine more competitive in the world shipping market. This, in turn, could reduce the level of subsidies paid by the Government to help offset the advantages en- joyed by low-cost foreign com- petitors. Cargo Liner: Phase I," was pre- pared under contract by J.J. The first step of the study in- volved forecasting general cargo movements and service require- ments on selected worldwide trade routes served by the participating operators. The forecasts, which extended through the year 2000, produced profiles on each carri- er's cargo mix (percentages of breakbulk, containerized, and roll- on /roll-off cargoes), and service requirements (itinerary, service frequency, and port and canal constraints). Based on these individual pro- files, a conceptual ship design was developed for each operator. These designs were tailored to each company's specific cargo and service requirements. The final step was the devel- opment of a composite design based on the most important characteristics of the seven in- dividual designs. The resulting composite ship, with available options, has the following speci- fications: length between perpen- diculars, 620 feet to 800 feet; beam, 105 feet 6 inches; depth, 69 feet 6 inches; draft 29 feet 6 inches to 32 feet 6 inches; dead- weight tonnage, 19,500 to 29,600; service speed, 18 to 23 knots; and shaft horsepower, 14,500 to 42,500. While the study assumed the use of a steam powerplant, it was recognized that diesel propulsion offers fuel-saving advantages, and would meet the lower speed and horsepower requirements of some shipowners. The report suggested that powerplant trade-off studies be conducted at a later date. The composite design also can be modified to facilitate different cargo mixes, depending on the con- tainer, roll-on/roll-off or break- bulk requirements of the ship- owner. The report recommends con- tinued development of a stand- ardized vessel and concentrated research on optimizing such a ship. This would involve such ef- forts as model testing and apply- ing technological advancements to the production of the ship and its cargo-handling systems. 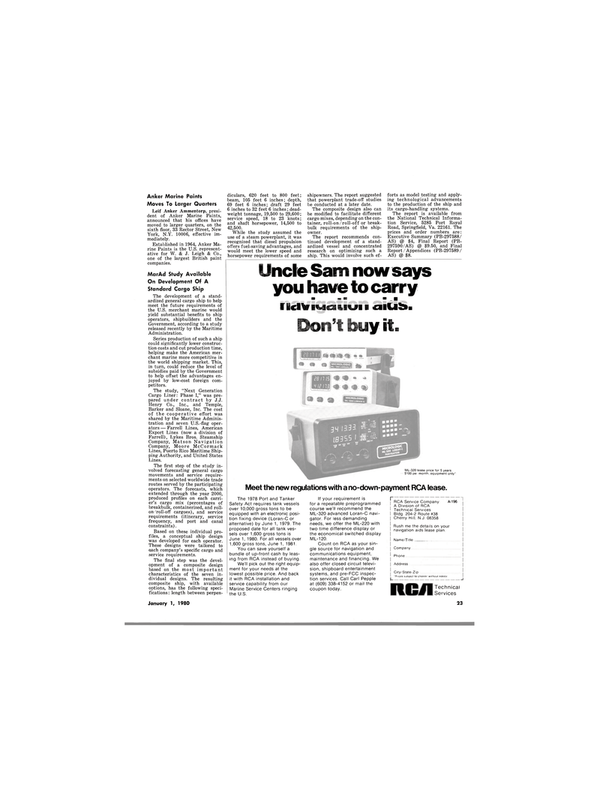 Meet the new regulations with a no-down-payment RCA lease. June 1, 1980. For all vessels over 1,600 gross tons, June 1, 1981. You can save yourself a bundle of up-front cash by leas- ing from RCA instead of buying. Marine Service Centers ringing the U.S. Rush me the details on your navigation aids lease plan.